Protect the sea, protect the environment, protect the world’s pinkest wild dolphins. Come and see them for an unforgettable experience! Hong Kong Dolphinwatch Ltd has been operating ecological tours to see the Indo-Pacific humpback dolphins in Hong Kong since 1995. 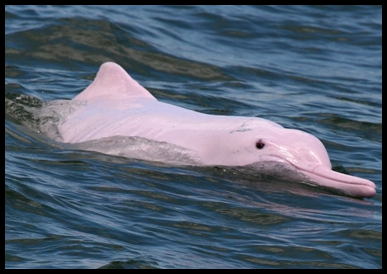 Join us on one of our tours and enjoy a day out with these beautiful pink dolphins! Details on booking, sightings, how you can help the dolphins and much more can be found in the legend on the left. If you wish to join one of our schedule tours which are run every Wednesday, Friday and Sunday, please click here for booking information. If you wish to have the whole boat to yourself, please click here for details on how to charter us. Join our team to lead our boat trips! We are constantly looking for like-minded people who are as passionate about the dolphins and the environment as we do to lead our boat trips. Aside from scheduled trips every Wednesday, Friday and Sunday, we have charters for schools and groups on other days of the week every now and then. Majority of our passengers are English speaking, some others can only understand Japanese, Putonghua or Cantonese. If you are fluent in English and preferably one or more of the other languages mentioned, or if you only speak English, as long as you love nature and particularly our beloved pink dolphins, you are the one we are looking for. We are extremely keen to search for candidates who can work on weekdays, but if you are only free to work on Sundays and holidays, you are also welcome. You don't need to have any background in marine science or eco-tourism but if you do, it is a big plus. We will provide adequate time and training to help you. Please send your CV to info@hkdolpinwatch.com. Looking forward to welcoming you to our team! Act NOW~ DOLPHINS NEED YOUR HELP !!! The Environmental Impact Assessment regarding the HKIA's third runway has been released on 20 Jun. The proposed third runway will lie at the core habitat of our chinese white dolphins. We regret to say that until further notice, we are unable to accept $1,000 bills due to the recent proliferation of high quality forgeries. Thank you for your understanding. For scheduled trips starting on 1st April 2014, the standard adult rate and the child (aged 3 -11) rate is revised to HK$420 and HK$210 respectively. With immediate effect, for the tour pick-up in Tsim Sha Tsui, we gather straightly on Middle Road (OUTSIDE Kowloon Hotel). We deeply apologize for any inconvenience caused. We are happy to announce that we have produced a book called “The Story of Hope” which is available on board of our trip and in our office. Inspired by a young calf named Hope by scientists, this nearly 200-page bilingual publication is packed with information and amazing photographs, majority of them taken by our in house photographer Mr Ken Fung and others by Mr Bill Leverrett, founder of Hong Kong Dolphinwatch. If you want to know more about the wild dolphins in Hong Kong, related environmental issues and if there is any way you can do to help, you will not want to miss it. This book is also an excellent choice for birthday gifts and presents for other occasions, particularly for students who need information for their liberal studies discussion in school. With immediate effect, if any school and charitable group charters a trip with us, we will offer 2 free copies of the book to each trip, for as long as stock permits. Unit price of each copy is HK$98. If you buy two, it is HK$180 (@$90). For three copies of the book, you only have to pay HK$240 (@80). Starting from March 2012, we are using a larger cruiser that can hold a maximum capacity of 56 passengers (our former boat is a 38-passenger boat). We are happy to offer a greater discount than the usual 10% off we have been offering to schools and charities. Please click here for the special prices. "Dolphins deserve same rights as humans", say scientists. Click here to read more. We are very honoured to be named one of the 100 heroes! Please click here to read more. How much do you know about the cruelty surrounding keeping the largest species of dolphins orcas in captivity? To learn more, please click here for Humane Society International Dr Naomi Rose's report. 10-12-2010 ::: Another runway in the dolphins' home? Click here to listen to the discussion aired on December 7, 2010 at RTHK during which our Media Spokesperson Janet Walker spoke for our dolphins. 15-8-2010 ::: Join us on Facebook now!! 2-8-2010 ::: Our Youtube Page. Tell Resorts World to free 25 dolphins being held in captivity.